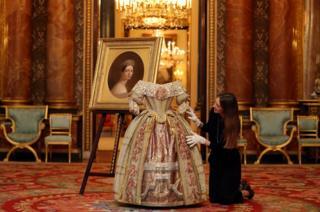 Image caption A Buckingham Palace staff member poses with Queen Victoria's Stuart Ball costume at the preview of a new exhibition exploring the life of Queen Victoria, which will open in July as part of the Summer Opening of the State Rooms at Buckingham Palace, London. 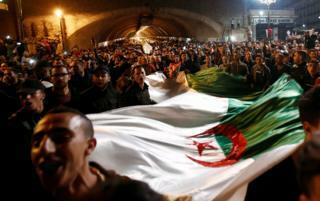 Image caption People carry a national flag as they celebrate on the streets of Algiers after Algeria's President Abdelaziz Bouteflika submitted his resignation. Mr Bouteflika, who has been in power for 20 years, had already dropped plans to seek a fifth term as opposition to his rule grew. 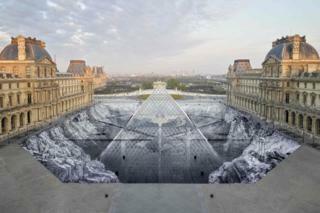 Image caption A giant collage by French artist JR, in the courtyard of the Louvre in Paris, was unveiled to mark the 30th birthday of the gallery's glass pyramid. However, within only a few hours it had been torn to shreds by visitors walking over it. 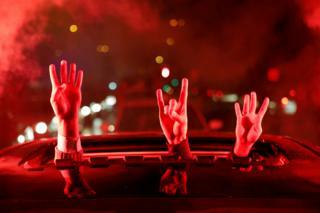 Image caption Supporters of Turkey's President Recep Tayyip Erdogan's AK Party gesture after voting in the municipal elections. The AKP is contesting a slim victory by the opposition CHP (Republican People's Party) in the country's biggest city, Istanbul. 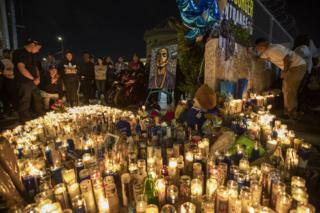 Image caption People mourn for rapper Nipsey Hussle in Los Angeles, California. The Grammy-nominated artist was shot in front of the Marathon Clothing store he founded in 2017 on the day he was scheduled to meet with the Los Angeles Police Department to discuss ways of stopping gang violence. Image caption Migrants and refugees who say that they seek to travel onwards to northern Europe, scuffle with police officers near the town of Diavata in northern Greece. 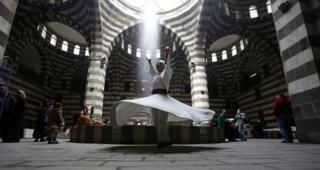 Image caption Dervish dancers perform during an event titled the Festival of the Syrian Bread, held at Khan Asaad Basha, in the old city of Damascus, to commemorate the Syrian New Year. 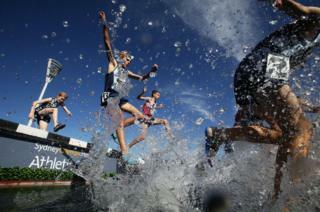 Image caption Competitors race in the under-16 boys steeplechase during the Australian Track and Field Championships at Sydney Olympic Park Athletic Centre in Australia.